El Quetzal (Beautiful songbird) - This aptly named vihuela is special in several ways. At first glance you will notice the front and back body edges are alternating maple and mahogany and the arrow rosette around the sound hole. 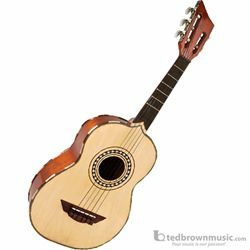 However Mariachi teachers and players will appreciate the functionality of strap buttons, an additional 2 frets of tonal range (total of 6 frets), smooth action tuners. But most notably, this vihuela is equipped with the special H. Jimenez design rosewood Thunderwing™ bridge with saddle for optimum performance adjustability.